Magda Abu-Fadil visits Al Arabiya in Dubai. 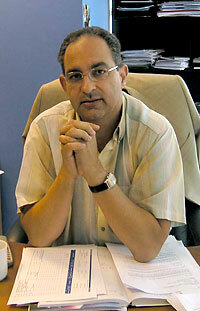 03 Productions general manager Fadi Ismail serves on LAU’s Alumni Association’s Executive Committee. IPJ director visits key media organizations in Dubai. IPJ director Magda Abu-Fadil toured the Middle East Broadcasting Center’s Dubai headquarters, including the all-news Al Arabiya channel, and met with officials, as part of the institute’s outreach to maintain contact with Arab and international media. Key among those visited was LAU alumnus Fadi Ismail (B.A. 1984), the general manager of 03 Productions at Dubai Media City, who had headed current affairs at MBC for several years when the company was based in London. Ismail, an Alumni Association Executive Committee member who also served as assistant director for news and international operations at MBC, took Abu-Fadil on a tour of the building. Al Arabiya and its parent network MBC are owned by Saudi Arabia’s Sheikh Walid al-Ibrahim, the late King Fahd’s brother-in-law. 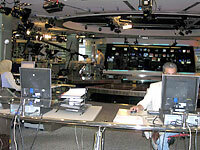 The news channel was launched in 2003 as an alternative to the Qatari-based Al Jazeera and boasts state-of-the-art technology, studios and news gathering operations. MBC had spent 11 years in London before being enticed to the expanding domain of Dubai Media City, which has turned into a magnet and hub for various international news organizations. MBC’s holdings include MBC2, an entertainment-only channel based in Bahrain. 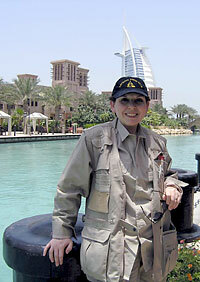 Abu-Fadil was in Dubai for less than a day in May 2005 on the way back to Beirut from Nairobi where she delivered a speech at the International Press Institute’s World Congress and 54th General Assembly and was one of over 400 editors, media executives and leading journalists from 55 countries who gathered for the four-day event.